Compass Bicycles is proud to be the sole distributor of SKF bottom brackets world-wide. 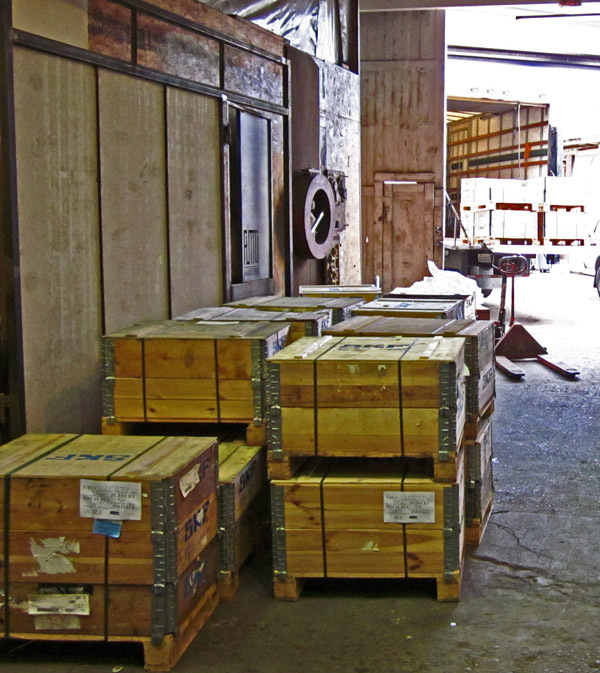 Svenska Kugellagerfabriken (SKF) has been the leader in bearing technology since 1907. Today, SKF is the largest bearing manufacturer in the world, and their bearings are used in Formula 1 racecars and other high-end applications. SKF’s ball bearings have been used on many of the best bicycles. Campagnolo’s famous ball bearings were made by SKF. Starting in the 1940s, Alex Singer and René Herse equipped their custom-made bottom brackets with pressed-in SKF cartridge bearings, because they were the best available. When SKF decided to make bottom brackets, using the highest-quality bearings was a given. Bearings run smoothly only if they are kept clean and well-lubricated, so the company developed and patented custom seals that keep the grease in and contamination out. SKF designed the bottom brackets as completely integrated units. By running the balls and rollers directly on the spindle and shell, the design saves valuable space, allowing the use of larger bearings for greater strength and durability. Why is this such a big deal? Many other high-end bottom brackets use standard bearings pressed onto the spindle and into the shell. There is only so much space inside a bicycle’s bottom bracket shell, so the ball bearings have to be much smaller (usually 2.8 mm diameter vs. 4.5 mm on the SKF). And many expensive bottom brackets don’t use any seals, relying on the dust seals of the bearings to keep them clean. These dust seals aren’t designed to keep out water… and they don’t. As a result, riders who ride through rain and snow have to replace their bearings annually. 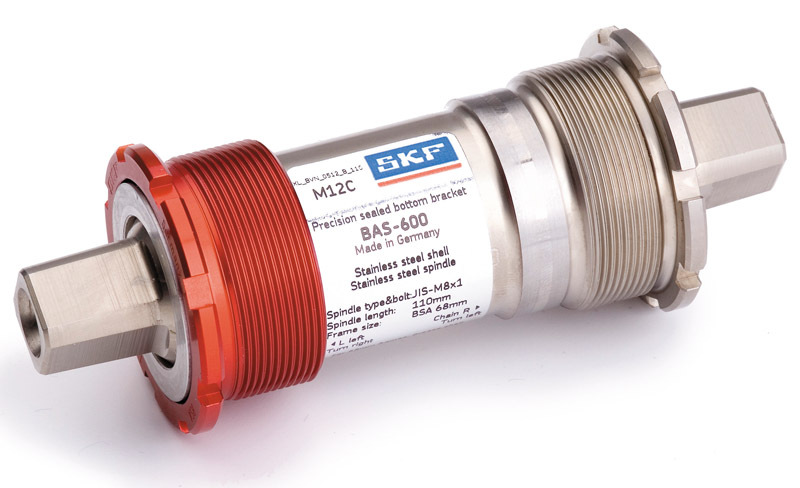 SKF wanted to design a bottom bracket with a maintenance-free life expectancy of 10 years or 100,000 km (65,000 miles) under harsh conditions, so they had to address these concerns. They also made all parts from stainless steel or aluminum, so corrosion is not an issue. With such an excellent product, SKF did not anticipate the difficulty of selling their bottom brackets. 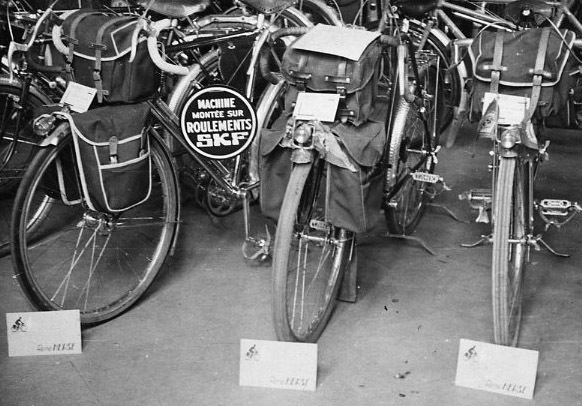 Without their own access to bicycle shops, the company relied on a variety of distributors world-wide, who often buried the bottom brackets deep in their catalogues. Without adequate promotion, sales lagged behind their targets. To reflect the superior quality of SKF bottom brackets, we have extended the warranty to 10 years or 100,000 km (65,000 miles), whichever comes first. This warranty includes the bearings. (We are unaware of any other maker of bottom brackets whose warranty includes the bearings.) We are confident that these are the best bottom brackets ever made, and we are proud to make them available to cyclists world-wide. We now offer the Park BBT-18 installation tool, because it is important to use the correct tool when installing these bottom brackets. We aren’t making money on the tools (we sell them at a discount), because we want you to be happy with your SKF bottom brackets! This entry was posted in Bottom brackets, Product News, Uncategorized. Bookmark the permalink. Excellent, these seem like the ultimate in bottom brackets. From the photos, it appears that both sides might have adjustable cups. Is this the case, or is the drive side cup fixed? Having both sides adjustable can be very convenient for making fine adjustments to maintain crank arm symmetry, or to adjust chainline. This is especially apropos to older bike frames that were designed to use asymmetric spindles. The right-side “cup” actually is part of the cartridge. You screw the entire cartridge into the frame until it bottoms out against the flange. The left-side cup simply is a sleeve that holds the BB in place. This means that the alignment of your frame’s threading is not crucial, because the BB is a self-contained unit. You can adjust the chainline by using a spacer under the driveside flange. Ah, so it’s just like most modern cartridge units. Spacers aren’t the most elegant solution, but I suppose they do the trick! I have an older Tange sealed cartridge unit that utilizes adjustable cups with lockrings on either side, allowing you to make adjustments without spacers. I think the only brand that still sells this type of unit is Phil. To get a secure fit, you want to reduce the number of interfaces where things can vibrate loose. 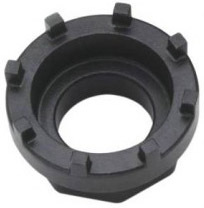 Ideal is a flange against the BB shell – 1 interface. A lockring has two interfaces: Against the BB shell and on the threads of the cup/cartridge. So that is the same as a spacer (interface between spacer and BB shell; interface between cartridge flange and spacer). Phil’s BB has no real sideways retention, which is why you have to use Loctite when installing it. Otherwise, the cups can just come loose. It works most of the time, but when it doesn’t, it will stop your ride. Any chance they will offer bearings/cups for use with more current outboard bearing or BB30 cranks? The market for high-end square taper bottom brackets seems to be pretty niche. Plus making a bottom bracket with a 10 year lifespan doesn’t help your repeat sales! Repeat sales through planned obsolescence? I recall that Harden in Britain, who made cartridge bearing hubs with bearings that were too small, claimed that they made more money replacing bearings than selling hubs. That isn’t our business model. We sell what we ride… and we are happy to remain a “niche” supplier. I’m much more optimistic about BB30 than ISIS. I do think outboard bearings are a stop gap solution. Planned obsolescence isn’t a consumer friendly business model. I just don’t want SKF to exit the bike business because they deem it unprofitable due to the low sales volume. 2 of my 3 bikes have SKF brackets in them and if they made a Campy Ultra Torque compatible set I’d buy it. I want them to be around when I build up my next bike. Considering how long these last, you might just switch the bottom bracket from your current bike to the next… I do see a need for traditional high-end bottom brackets, so if SKF ever becomes unavailable, Compass Bicycles will find a way to fill that niche. Is it just my eyes, or is the center of the cartridge a little slimmer than most other cartridge bottom brackets? My next bike is going to have the taillight wiring going through the bottom bracket housing so a little extra room will be helpful. I have two bikes with taillight wires running through the bottom bracket shell, both with SKF cartridges. There is enough room, but not much to spare. How appropriate that this post should come just two days after I spent the evening looking up these very bottom brackets! It may only be theoretical at this point but I’ve been converted. I’ll be designing my next frame around getting this bottom bracket (mating W.I. Eno cranks to modern fixed hubs on a cross frame is no small task!). now i know why I can’t find these anymore in Germany – you seem have them all! Only the ISIS and Italian threaded square tapers are available here . . . i knew you sold them, but now i know you’ve cornered the market and increased my shipping costs – and hopefully saved this wonderful product from extinction! In fact, no European distributor has carried the whole line in years. International shipping costs are only $ 13 for up to four bottom brackets. So you might actually save money! Would any SKF BB fit a Shimano 105 triple crankset which came stock on my Trek 520 (2004 or so)? Before you remove the cranks, check how much room you have to the chainstays. Then remove the cranks. If the bottom bracket has a square taper, then Shimano is JIS. Measure the length and select the nearest SKF bottom bracket – go wider if the cranks were too close to the chainstays, or a bit narrower if you had too much space (but also check that the chainrings have clearance). Chapeau! Thanks for an exceptional product Jan. I installed the 116mm square taper on my new Thompson. It fits perfectly. I look forward to many happy brevets. Any chance they will make a 103 mm square taper spindle? I still have a couple Dura Ace 7410 cranksets in use. The design of the bottom bracket makes it almost impossible to create a spindle that short, so I would not hold my breath. how good is the interface tool. i used to hate dealing with old cup/cone lockrings witch would get mangled up so quickly. the skf cups look like old cup/cone lockrings. one of the best things about phil and shimano cartrige bbs is the installation interface. never slips or ruins the cups. why didnt skf just use the shimano or phil interface? The tool has 8 interfaces, so it’s unlikely (impossible?) to slip. The nubs are a bit longer than they need be, so I ground off a bit (with a simple grinding wheel) on mine, to give a perfect fit. It works fine out of the box, but I am a bit of a perfectionist. This tool is far superior to the old “hook” wrenches, which tend to slip off the cup or lockring, as you say. Installation really is super-easy with these bottom brackets. The Shimano or Phil Wood tools are great, unless you are on the road and did not bring the tool. Trying to tighten a Phil Wood BB that came loose in Germany was not fun! (Phil Wood is unknown in Europe.) The SKF bottom brackets can be tightened with a hook tool in a pinch (which every bike, motorcycle and car workshop has). Just be careful not to pull too hard, as the hardened stainless steel is brittle and can break. That is why we sell the ISIS tool, which most bike shops also have. If you’re worried about the tool slipping you can hold it in place with a bolt and washer while you tighten/loosen the lockring. I have a J.A. Stein tool for Shimano cartridge units that threads onto the spindle and uses a spring to hold the tool in place. Very handy when you have a frozen BB to remove. Stein also make a locking lock ring wrench (picture a big pair of vise grip pliers with notches on the jaws). im likin these bbs. thx for offer them. what about 73 bb shells. i see u have them for isis but what about sq taper. Do the SKF Bottom Bracket work with TA Carima. I think TA claims it needs a 107 mm tapper (i.e. the compact 110)., or am I wrong? TA used to use the JIS (French) tapers, but I cannot find any reliable information on their current products on their web site. In any case, I cannot see any reason why the SKF bottom bracket would not work with the TA Carmina, even though I have not tried that combination. I think TA Carmina is ISO, not JIS. http://www.specialites-ta.com/gb/manivelle-carmina.html. I wonder when TA switched from the old French standard (which later became JIS) to ISO – if at all. Unfortunately, every crank maker has a slightly different interpretation of what JIS and ISO mean, and it even varies from one production run to the next. We offer the JIS in 110 and 113 mm, as well as ISO in 111 mm. If you find that when test-fitting the bottom bracket, it is the wrong taper, then you can return it.